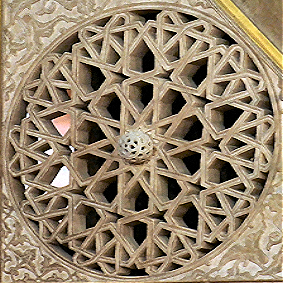 The ornament on the window from Konya was quite different than all ornaments we have seen before – the unusual shape of the star as well as the incredible accuracy of the construction make it very special. In the next example we will also deal with stars but the challenge will be different. This time we will go to the Rüstem Pasha Mosque. The Rüstem Pasha Mosque (Rüstem Paşa Camii, 1560) in the Eminönü district over the Golden Horn is among the city’s architectural gems. The mosque is famous for its extensive decoration with Iznik tiles. Our interest in this mosque will be quite different. We will look at the medallion at the minbar. In the center of the medallion there is one large ten-fold star and a maze of lines on the edge of the medallion. We already know how to create any star, but we will have to spend some time developing the edges of the ornament. Like in all ornaments using pentagons or decagons, we will have to concentrate on the part that we see without trying to extend it further on the plane.